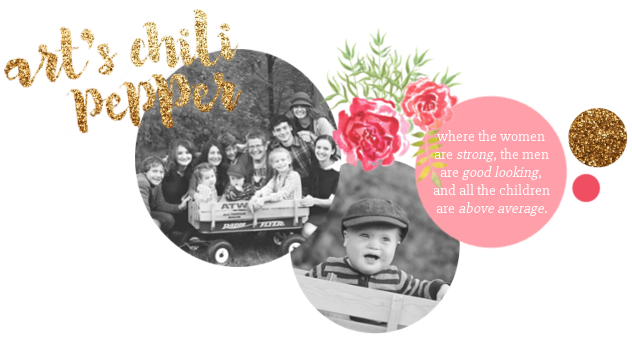 Art's Chili Pepper: Stop Saying "I'm Sorry"
In the last few weeks, I have seen a number of posts on other blogs apologizing for being unable to visit other bloggers as frequently as we did over the summer. I have also received comments from bloggers with about the same message. Apologizing and offering reasons for not being around. For several weeks I have been thinking along the same lines. Now that fall is here, school is starting, I don't have time to post and visit like I have in the past and as I would like to. But that doesn't mean I don't still love you all. I have, seriously, wondered if people would be offended and if they would stop visiting me and this and that. I so enjoy the friendships I have formed through blog world. Which is a little weird for me to think about too much. The whole idea of having friends that I have never met. But then again, it is not so different than the pen pals I had in school. But that is a whole other topic. Here is the thing. Our real life world is first priority, right? And for me that means teaching school, cooking, cleaning, sewing and all the other things my family needs from day to day. for me that means studying for my classes and keeping up with my home work. For some of you it means going to work (We can't all be as lucky as Erica who gets to blog at her really boring job. Smiling.) The point is we can't put our real life on the back burner to write about it. For one thing there would be nothing to post about if we aren't out there living it. And just think of what we would miss out on. After all, why did you all start blogging to begin with? I blog to record my family story. I blog to keep up with my family around the world. I have gotten many benefits I never expected from blogging like great friends, daily laughs, inspiring stories, moving posts, encouragement and the list does go on. Thank you to everyone who has touched my life in the last 8 months. You know who you are. So what is everyone apologizing for? Don't get me wrong. I appreciate your thoughtfulness and kindness in letting me know. But don't apologize for it. You haven't done anything wrong! You are doing what you are supposed to be doing. Don't feel bad. We all understand. Most of us are in the same boat. "...we are all under time constraints right now and are trying to figure out how to make it all work...I have a lot going on and will not be able to visit others as I usually do and that it is no reflection on them but just that my responsibility load will be far greater once school gets under way and there will be the added strain of all the travel and our company. I believe I will have only 1 uninterrupted full week at home once we leave on vacation until after Thanksgiving. I am not used to being away so much. I am not complaining, just that on my normal routine it would be tough for me to visit everyone’s blog everyday, and this fall it will be impossible. So in figuring out how to make it all work... I have been thinking a lot about what to do. And I have had to go back to the basics…why I started to blog. 1- to keep a history of our families joyful, and sometimes not so joyful, moments and 2- to keep up with loved ones who aren’t nearby any longer. Second, one of the reasons I have been faithful to make time to do so is because I so enjoy the interaction with those who write me. The comments are like little splashes of joy in my day. Some weeks it is literally the only interaction I have with my peers. And then on weekends, if I have down time, I will use that time to visit other people’s blogs. That is my current plan. I won’t really know how effective it is until we get back from our trip and get into the swing of school and our fall routine..."
So there it is my dear blogging friends. I won't say I am sorry but I will promise to not be offended if you promise to do the same. 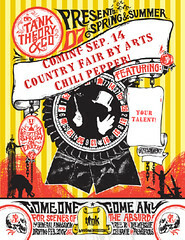 The Country Fair is coming Next Monday! Get your entry ready. Need to know more? Click on the button below for all the details! Sometimes those followers are a curse instead of a blessing b'c I FEEL responsible to post. And then following also is rather guilt producing b'c I see HOW many posts I have NOT been to read. God bless and I'm not feeling guilty ... much! Makes perfect sense to me, Kat. Life definitely does get busy, especially when school starts, and even busier when Christmas time rolls around. So true! Fall has me busier, too! Blogging is suppose to make our lives better for us to learn from and share with each other, not just another thing we women have to feel guilty that we are not doing as much as we should! By the way, what a fun new fall background you have now! Totally agree. When I post that usually means I have time for the computer. On days I don't post I don't have time...hence the reason for no comment to my friends on those days as well. I usually can't play catch up either, so we all just do what we can, and value and enjoy the comments when they come our way. Please stop by my blog for a special blessing. Amen, Kat! I'm fairly new to the blogging world, and already the guilt trips are piling on. For my part, living my life comes before writing about it. Well, I guess you could take that comment two ways! Lol. Amen! I love reading blogs but I won't feel guilty if I don't leave a comment or don't get to reading it all. I have to focus on my family. Thank you for writing this. Oh yeah, don't forget to visit my blog...today is game day! Thank you for posting this. I have been racking my brain between figuring out what to post, writing my post, in between dropping, one teen off for school, coming back home and doing school with my youngest, then making lunch, picking up the older one and then doing some housework and I usually blog in the evenings now. I have even noticed the drop in others blogs and you're right. We have to go back to why we are blogging. Thank you for making my life that much easier and now I am guilt free. I've actually visited your blog a few times before. Even then, I have loved your heart, your transparency, your candid way of expressing yourself. I love chili peppers. My husband and I lived in Chiang Mai Thailand for a whole year, for me, nothing beats Thai food where chili is a way of life! Thanks for stopping by my place and leaving such a kind comment. I truly appreciate it. ANd yes, I agree with you. We all write blogs for personal reasons... the blog friendships we have made along the way is the added bonus. We need not apologize when we can't visit one another as often as we would want to. Even in real life, we are not required to visit friends everyday. Coffee together, or a meal at a friend's place once in a while... that is how it is for us in real life. I believe it is the same in blogworld. True friendship is all about acceptance and affirmation. It doesn't place heavy demands or expectations on the other. Thank you again, Kat. I look forward to visiting your blog again in the near future. Please stop by my blog for a special blessing again from God. Sitka has an award for you at All GODS Creatures. I did miss reading your posts so I am catching up today. I can't stand it not knowing what everyone is writing about. So, when I do miss a few days of being online, which I have recently, I can't just pick up where everyone is at. I have to find out what you have been up to. We are going on vacation next week. So I will miss everyone then too. But, I plan to stay in tune for the next week. Agreed! :) and very well stated. It seems we all have less time once school starts. I do at times feel bad when I don't have time to visit others, yet, as you said, priorities. It does not mean we don't still love each other and appreciate all the wonderful friends we have here in bloggy land :) Have a great time on your trip, and a wonderful year! I'm so glad I read this post. I literally was about to apologize to you for not having been around much lately. But you're so right! Family activities come FIRST, not second. Blog friends all get busy and we all are MOMS so we all have the same general stuff. I have missed you around, but I totally understand it, for sure! Y'all have a great trip. Well, I intend to be offended. Okay, I wouldn't post that on anyone else's blog, but I know you'll get a laugh from it. Especially since I know some of those busy traveling weeks you'll be here visiting with Ben, Button and I. I must admit that I chuckled a bit as I read your post. I'm trying very hard to just post when I have time, read if I can and not make this yet another project for my project list. Let's see how far those good intentions take me!